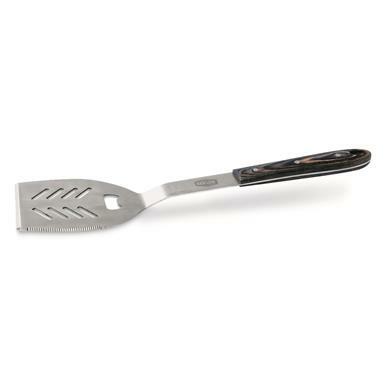 Designated tool of the serious Grill-meister! To be victorious in the battle for the best burgers, arm yourself with this seriously strong MAN LAW® Spatula. Premium wood handle and serrated edge give you the control you demand to keep burgers from flipping overboard. Equipped with a bottle opener to celebrate a job well done. Easy clean stainless steel construction.